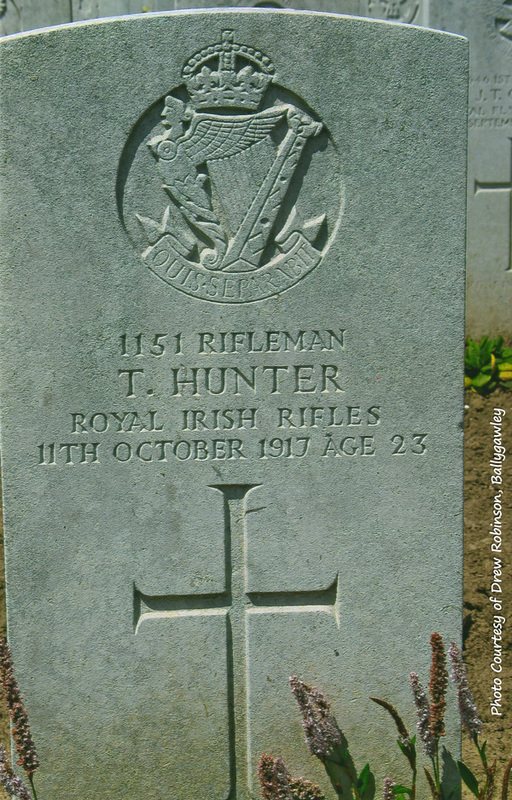 30/12/2015 Rifleman Thomas Hunter is buried in Rocquigny-Equancourt Road British Cemetery. The cemetery lies between the villages of Rocquigny and Equancourt in the Somme region. 30/12/2015 Family: John Hunter, Margaret Hunter, William John Hunter (born about 1891), Sarah Jane Hunter (born about 1893), Thomas A Hunter (born about 1895), Mary E Hunter (born about 1896), Robert Hunter (born about 1898), Joseph Hunter (born about 1900). 30/12/2015 The CWGC record Rifleman Thomas Hunter as the son of John and Margaret Hunter, of Milberry, Caledon, Co Tyrone. 30/12/2015 Rifleman Hunter died of his wounds on 11th October 1917. Thomas was 23 years old. 30/12/2015 Rifleman Thomas Hunter was serving with the 16th Battalion of the Royal Irish Rifles when he was injured in France & Flanders. 30/12/2015 Thomas Hunter was formerly soldier no. 19452, in the Royal Inniskilling Fusiliers. 30/12/2015 Thomas Hunter enlisted in Caledon, County Tyrone. 30/12/2015 The 1911 census lists Thomas as age 16 living with the family at house 12 in Millberry, Caledon, Tyrone. Thomas, his brother and his father were all working as farm labourers. 30/12/2015 The 1901 census records Thomas as age 6 living with the family at house 4 in Selloo, Clones, Monaghan. John Hunter was a caretaker. 30/12/2015 Thomas A Hunter was the son of John and Margaret Hunter. Thomas was born in Saloo, County Monaghan about 1894.